Back row, from left, Thea Walsh, Lexi McKeown, Isabel Riches, Danielle Borelli, Sophia Lucas and Alana Evans; front row, Jessica Morrell, Evan Tingler, Kasey Karkoska, Liv Mitchell and Kyla Whitelock. Not pictured, Sam Burgi. Photo by Blueskystudio. 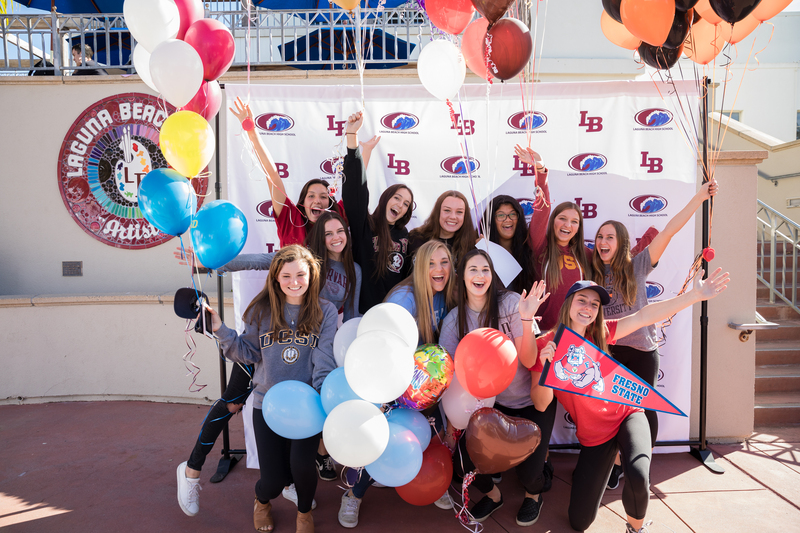 Six water polo players, two volleyball players, a swimmer, a diver and a rower from Laguna Beach High School committed to continue athletic pursuits as college students last week. Among polo players, Thea Walsh will compete for Stanford, Sophia Lucas at USC, Evan Tingler at Harvard, Alana Evans for Princeton, Isabel Riches at Brown, Kyla Whitlock for Fresno State and Danielle Borelli for McKendree. Diver Liv Mitchell will hit the board for Brown, Kasey Karkoska swim for Columbia, Lexi McKeown serve at sand volleyball for Florida State, Sam Burgi hit the volleyball court for UCLA, and Jessica Morrell row for UC San Diego.